Pathanjali gave a rejoinder stating that the other three have separate eyes and ears which was a disadvantage. If they concentrate on Ishwaras dance form by seeing, they will miss the laya or thala and if they concentrate on the laya and listen, they will miss out on the visual treat. However, Pathanjali, in his serpent form, had a common organ for perceiving sound and sight (it was commonly believed that snakes make use of the same organs for hearing and seeing) and therefore could concentrate on both the form and laya simultaneously. 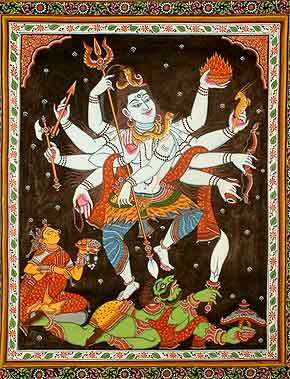 The Shambu natana sthothram has no words with Kombu or Kaal. This was sung according to the laya/ thala of Shivas cosmic dance.